To most Englishmen, the word Anarchy is so evil-sounding that ordinary readers of the Contemporary Review will probably turn from these pages with aversion, wondering how anybody could have the audacity to write them. With the crowd of commonplace chatterers we are already past praying for; no reproach is too bitter for us, no epithet too insulting. Public speakers on social and political subjects find that abuse of Anarchists is an unfailing passport to public favor. Every conceivable crime is laid to our charge, and opinion, too indolent to learn the truth, is easily persuaded that Anarchy is but another name for wickedness and chaos. Overwhelmed with opprobrium and held up with hatred, we are treated on the principle that the surest way of hanging a dog is to give it a bad name. There is nothing surprising in all this. 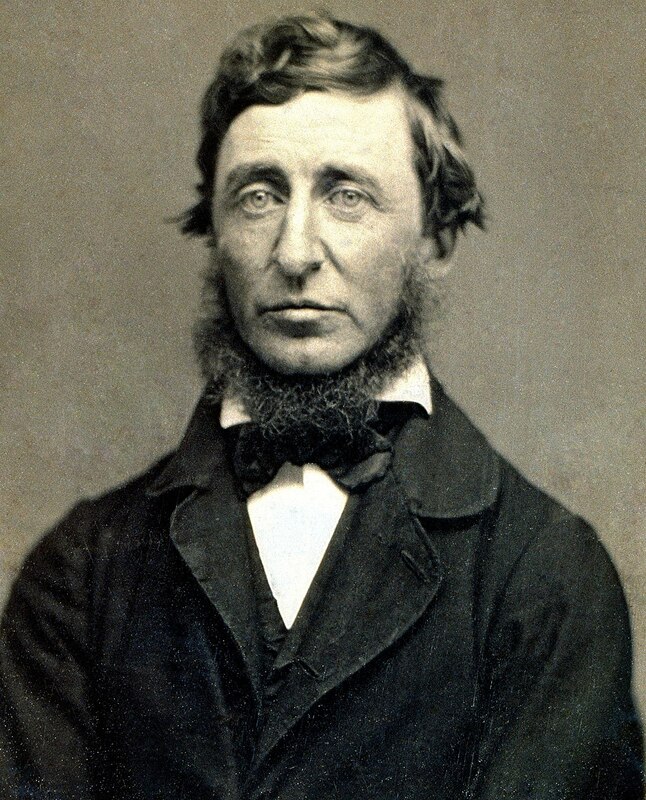 The chorus of imprecations with which we are assailed is quite in the nature of things, for we speak in a tongue unhallowed by usage, and belong to none of the parties that dispute the possession of power. Like all innovators, whether they be violent of pacific, we bring not peace but a sword, and are nowise astonished to be received as enemies. Yet it is not with light hearts that we incur so much ill-will, nor are we satisfied with merely knowing that it is undeserved. To risk the loss of so precious an advantage as popular sympathy without first patiently searching out the truth and carefully considering our duty would be an act of reckless folly. To a degree never dreamt of by men who are born unresistingly on the great current of public opinion, are we bound to render to our conscience a reason for the faith that is in us, to strengthen our convictions by study of nature and mankind, and, above all, to compare them with that ideal justice which has been slowly elaborated by the untold generations of the human race. This ideal is known to all, and is almost too trite to need repeating. It exists in the moral teaching of every people, civilized or savage; every religion has tried to adapt it to its dogmas and precepts, for it is the ideal of equality of rights and reciprocity of services. “We are all brethren,” is a saying repeated from one end of the world to the other, and the principle of universal brotherhood expressed in this saying implies a complete solidarity of interests and efforts. We, workers and inhabitants of the city of St. Petersburg, members of various sosloviia (estates of the realm), our wives, children, and helpless old parents, have come to you, Sovereign, to seek justice and protection. We are impoverished and oppressed, we are burdened with work, and insulted. We are treated not like humans [but] like slaves who must suffer a bitter fate and keep silent. And we have suffered, but we only get pushed deeper and deeper into a gulf of misery, ignorance, and lack of rights. Despotism and arbitrariness are suffocating us, we are gasping for breath. Sovereign, we have no strength left. We have reached the limit of our patience. We have come to that terrible moment when it is better to die than to continue unbearable sufferings. And so we left our work and declared to our employers that we will not return to work until they meet our demands. We do not ask much; we only want that without which life is hard labor and eternal suffering. Our first request was that our employers discuss our needs together with us. But they refused to do this; they denied us the right to speak about our needs, on the grounds that the law does not provide us with such a right. Also unlawful were our other requests: to reduce the working day to eight hours; for them to set wages together with us and by agreement with us; to examine our disputes with lower-level factory administrators; to increase the wages of unskilled workers and women to one ruble per day; to abolish overtime work; to provide medical care attentively and without insult; to build shops so that it is possible to work there and not face death from the awful drafts, rain and snow. kind of government would command his respect, and that will be one step toward obtaining it. subjects afterward. It is not desirable to cultivate a respect for the law, so much as for the right. idea, but is realized only when it dies as idea; and it is the same with the real. real in the corporeal ego, in me. the army are listening. Their fate is in our hands. truth. And how did the tyranny lose it? By deceiving the soldiers. 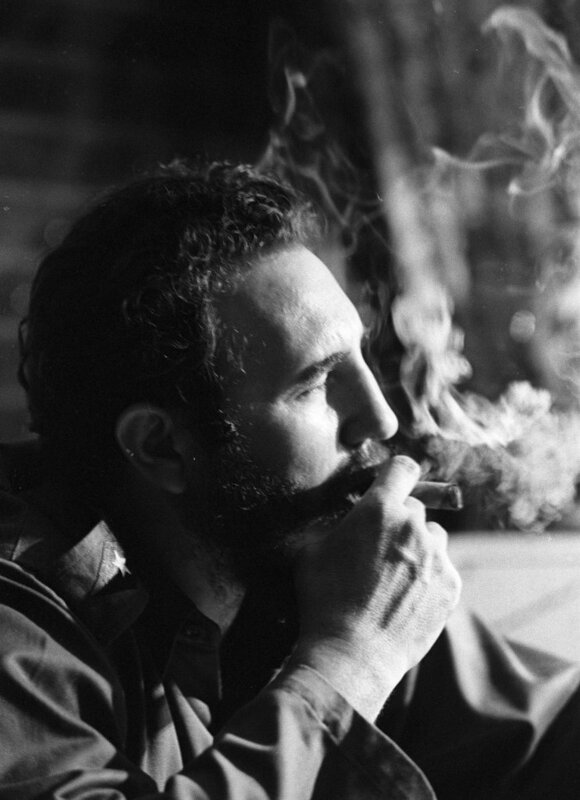 to history and to the people of Cuba the greater. Elka Ruvinskaia was born in the village of Novodmitrovka near Kherson in the Ukraine on the 21st January 1876 ( or possibly 1874 or 1878). Her family was Jewish and her father ran a small shop. After her studies she worked as a teacher. She was arrested for “political suspicion” in 1895. 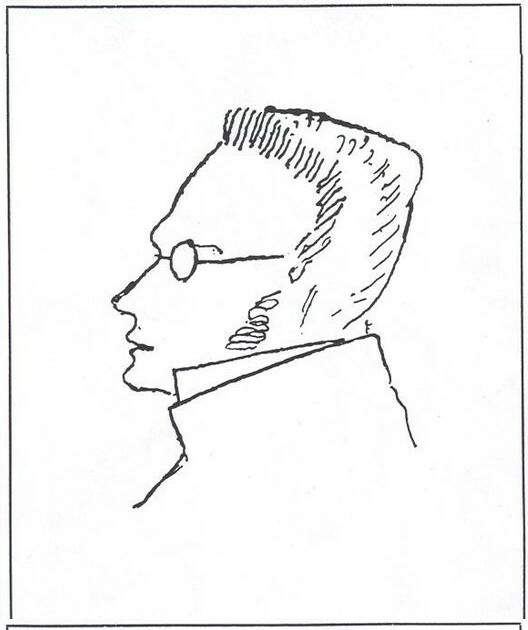 In 1897 she joined a Social Democrat group around the brothers A. and I. Grossman (who later became anarchists) in Elizavetgrad, and distributed their propaganda. In 1898-1901 she was a member of the Elizavetgrad committee of the Social-Democratic Party and the South Russian Union of Workers. In 1901 she fled abroad, living in Germany and Switzerland where she met Lenin and Plekhanov and worked for the paper Iskra. In 1903 In Switzerland she became an anarchist-communist. In 1904 she returned to Odessa and joined the group Without Compromise which was made up of anarchists and disciples of the Polish socialist Machajski. She was arrested in April1904 and in the autumn was freed for lack of evidence. She then joined the Odessa Workers Group of Anarchist Communists which distributed propaganda and organised workers’ circles. She began to acquire a reputation as one of the most outstanding anarchists in Russia. She used the pseudonym Babushka (Granny) – a strange alias considering she was still only around thirty! At the beginning of October 1905 she was arrested again but was again released with the October amnesty. She joined the Battle Detachment of the South Russian Group of Anarchist Communists which used the tactic of “motiveless terror”- that is attacks on institutions and representatives of the autocratic regime rather than particular targeted individuals . She helped prepare the notorious attack on the Libman café in December 1905. 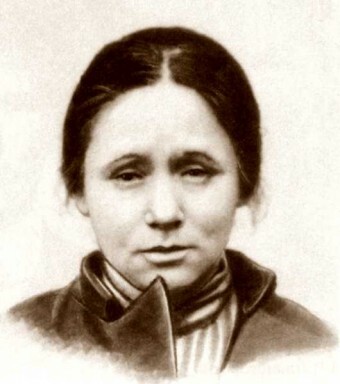 She was arrested and sentenced to17 years imprisonment in 1906 She escaped from prison on 15th December and fled to Moscow. 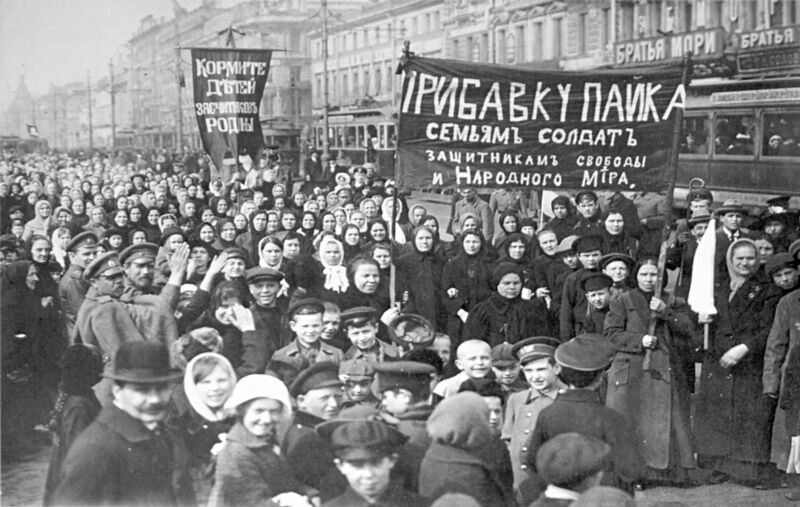 In December 1906 she joined the Moscow anarchist-communist organisation Buntar (Rebel) and agitated in the workplaces. After the arrest of group members in March 1907 she and some others fled to Switzerland where they edited a paper of the same name. I have few personal recollections of Georgii Valentinovich. Our meetings were infrequent, although they were not devoid of significance, and I gladly record my memories of him. In 1893 I left Russia for Zurich, as I felt that I could only acquire the education I needed by going abroad. My friends the Lindfors gave me a letter of introduction to Pavel Alexandrovich Axelrod. Axelrod and his family received me with delightful hospitality. By then I was a more or less convinced Marxist and considered myself a member of the Social Democratic party (I was eighteen and had begun work as an agitator and propagandist two years before going abroad). I am very much indebted to Axelrod for my education in socialism and, however far apart he and I may have moved subsequently, I look upon him with gratitude as one of my most influential teachers. Axelrod was full of awe and reverence for Plekhanov and spoke of him with adoration. 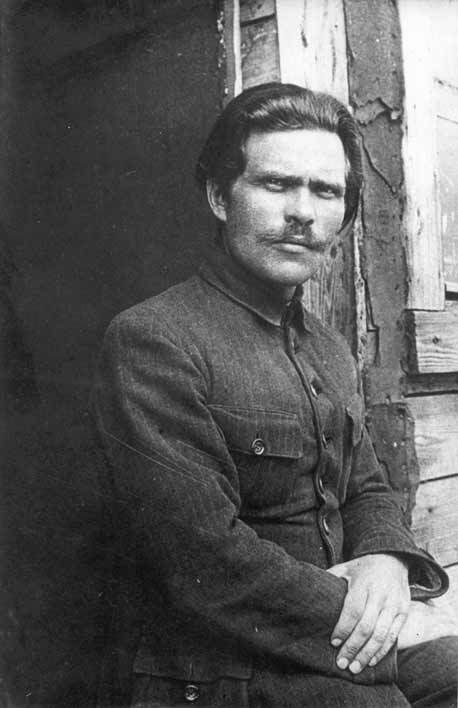 This, added to the impression of brilliance that I had already gained from reading Our Differences and various other articles by Plekhanov, filled me with an uneasy, disturbing sense of expectation at the prospect of meeting this great man. 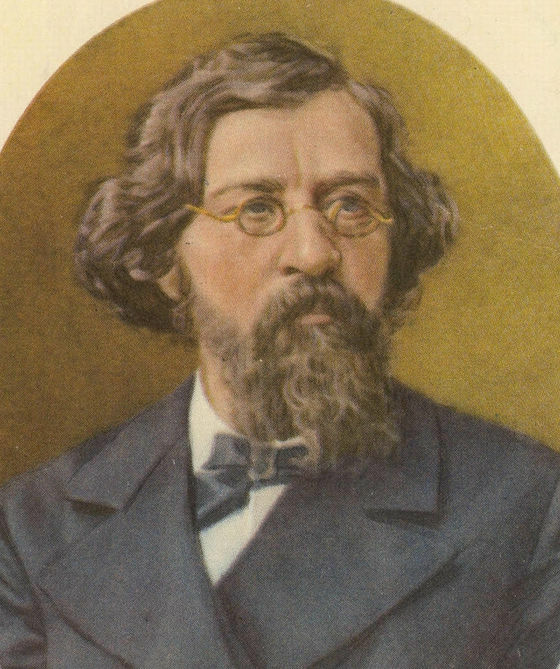 At last Plekhanov came from Geneva to Zurich, brought there by a dispute among the Polish socialists on the nationality question. 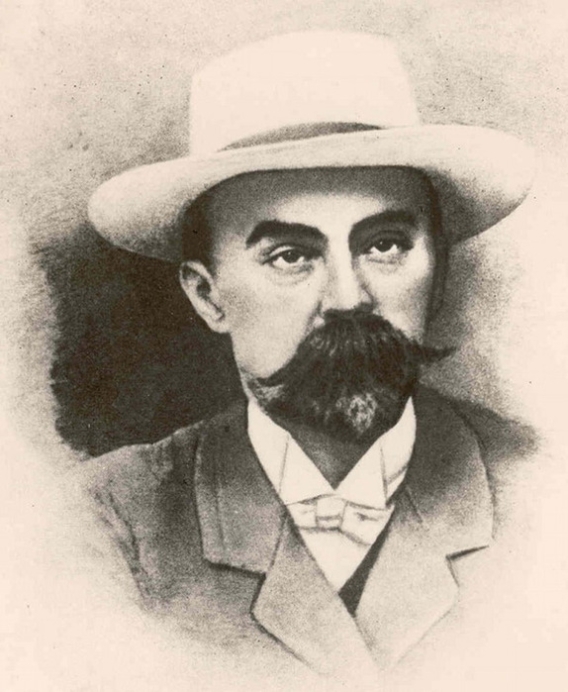 The nationally-minded socialists in Zurich were headed by Jodko. Our future comrades were led by Rosa Luxemburg, then a brilliant student at Zurich University. 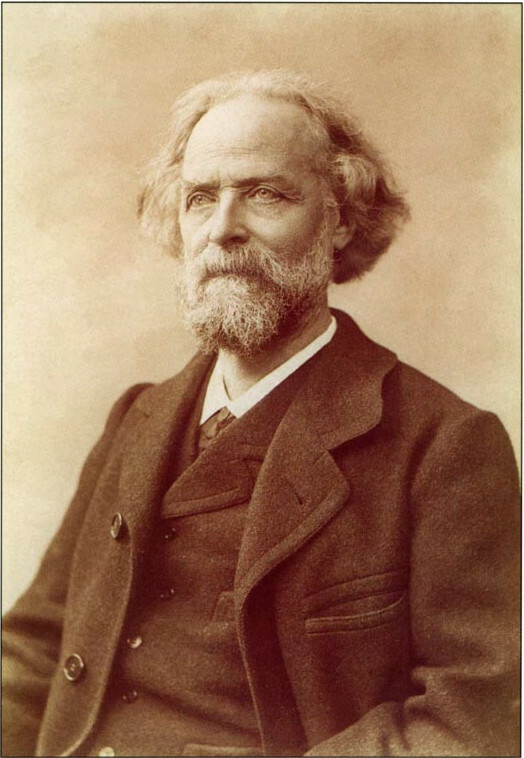 Plekhanov was to pronounce on the conflict. For some reason his train was late, so that my first sight of Plekhanov was destined to be slightly theatrical. The meeting had already begun; with rather wearisome emphasis Jodko had been defending his viewpoint for half an hour when into the Eintracht Hall strode Plekhanov. THE TRAGIC events in Barcelona at the beginning of May were not caused, as has been claimed, by an outburst of stupidity or an act of collective madness. Events of such magnitude, which threw sizeable masses into struggle, bathed the streets of the Catalan capital in blood and cost the lives of hundreds of men, are not produced by caprice: they were a response to profound and powerful causes. 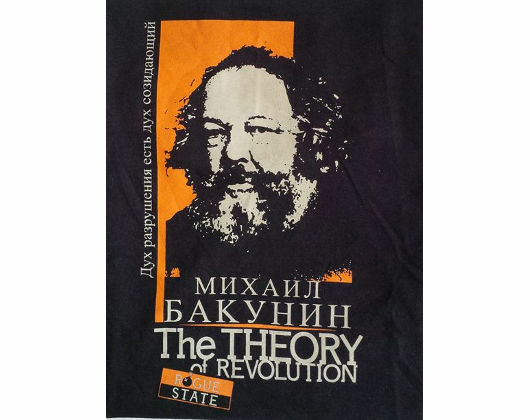 We leave it to the sentimental petty bourgeois to “lament” what happened without pausing to examine the causes of the events; we leave it to the counter-revolutionaries, whose only concern is to smother the revolution, to condemn the movement. It is the duty of true revolutionaries to examine what caused the events and to draw the necessary lessons. The fascist insurrection of 19 July was not a simple act of rebellion by a few military “traitors”, but the culmination, in an acute and violent form, of the struggle begun in Spain between revolution and counter-revolution. The masses’ democratic illusions had been seriously shaken, but were revived by the victory of the labour-republican bloc in the elections of 16 February and the consequent formation of a government of the Left. The working class soon realised that reaction, despite its defeat at the ballot box, had not disarmed but, on the contrary, was preparing with redoubled ardour to take to the streets intent on blocking the advance of the proletarian revolution and installing a dictatorial regime. The July insurrection occurred after five months’ experience of a new government that demonstrated the absolute impotence of the petty-bourgeois Left to put an end to the fascist danger, or resolve in a progressive way the many political problems the country faced. 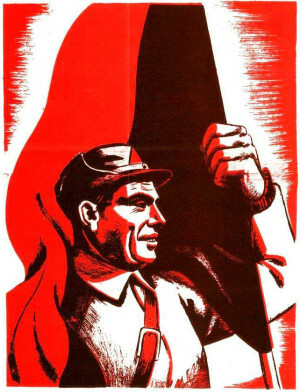 It fully confirmed the viewpoint, repeatedly expressed by the POUM, that the new experience of the Left would fail, and that a struggle was posed not between democracy and fascism but between fascism and socialism, that this struggle would take an armed form and could not be resolved in favour of the workers and against fascism except by the victory of proletarian revolution, which would solve the problems of the bourgeois democratic revolution and simultaneously begin the socialist transformation of society. Thanks to the splendid heroism of the working class, which was unshakeably determined to fight to the death to prevent the victory of fascism, the military insurrection was crushed on 19 July in Barcelona, Madrid and Valencia. Thanks to that prodigious heroism in the battlefields by thousands of workers who immediately and enthusiastically joined the militias, Franco was unable to achieve the victory which he thought quick and certain but which, after ten months of civil war, appears less and less likely. Put on trial for his part in a plot involving the fabrication of counterfeit money, Pablo and his comrades took advantage of the trial and used it as a political forum. I don’t have a strictly private life. For many years the apartments I’ve lived in with my wife were open to the members of our organization, to our friends and our political sympathizers, to a great number of people. During the war and the Nazi occupation of Europe, Israelites or men of the Resistance of all nationalities hunted by the Nazi services naturally found refuge at our home. When the Algerian revolution began in 1954, and Algerian militants were in turn pitilessly hunted down by the police services and terrorists under the orders of colonialism, my wife and I told the Algerian comrades to do us the honor of considering our home at their entire disposal. It was the same in Amsterdam. We hope to continue in this way until the end of our days, today aiding our Algerian brothers to the best of our abilities, tomorrow our black brothers of Angola and South Africa, our Indio brothers of Latin America, our brothers from everywhere, oppressed and exploited men fighting for the liberty and dignity of man. This attitude came to us naturally, and not at all through any special merit. 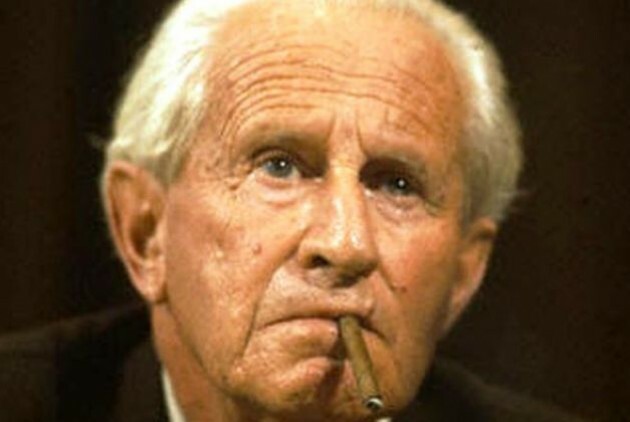 Personally, I always felt myself to simply be a man who had completely made his own the wisdom contained in the verse of our poet of Antiquity, Menander: I am a man, and nothing that is human is foreign to me. But, during the long life I’ve lived in the organization in which I have the honor of being a member, while trying to dominate the egoistic and narcissistic tendencies of our being, I’ve also learned how to accomplish those things necessary in relation to a political and social goal, and not only those things that were personally agreeable and easy. I at least wanted to act in accordance with that rules of social morality, more or less successfully. I lived the cataclysm of fascism in Germany and Europe of the 1930’s as a militant, and I also lived through the cataclysms of the Second World War as a militant. From all this I drew the conclusion that a certain dose of personal courage, intelligence, and critical spirit is necessary in order for every citizen to have the freedom to live, for the horrors of war to be avoided, so that society not fall under the yoke of privileged bureaucratic minorities. Neither the danger of fascism nor that of war and dictatorship are absent in the current world. This can be clearly seen in what is happening in France, in what’s happening in Africa from Algeria to Angola and South Africa, in what’s happening in Latin America, from Cuba to Chile, in what’s happening with East-West relations, from Laos to Berlin. M. Thiers, dans le sein de la Commission sur l’instruction primaire de 1849, disait: “Je veux rendre toute-puissante l’influence du clergé, parce que je compte sur lui pour propager cette bonne philosophie qui apprend à l’homme qu’il est ici-bas pour souffrir et non cette autre philosophie qui dit au contraire à l’homme: “Jouis”.” M. Thiers formulait la morale de la classe bourgeoise dont il incarna l’égoïsme féroce et l’intelligence étroite. La bourgeoisie, alors qu’elle luttait contre la noblesse, soutenue par le clergé, arbora le libre examen et l’athéisme; mais, triomphante, elle changea de ton et d’allure; et, aujourd’hui, elle entend étayer de la religion sa suprématie économique et politique. Aux XVe et XVIe siècles, elle avait allègrement repris la tradition païenne et glorifiait la chair et ses passions, réprouvées par le christianisme; de nos jours, gorgée de biens et de jouissances, elle renie les enseignements de ses penseurs, les Rabelais, les Diderot, et prêche l’abstinence aux salariés. 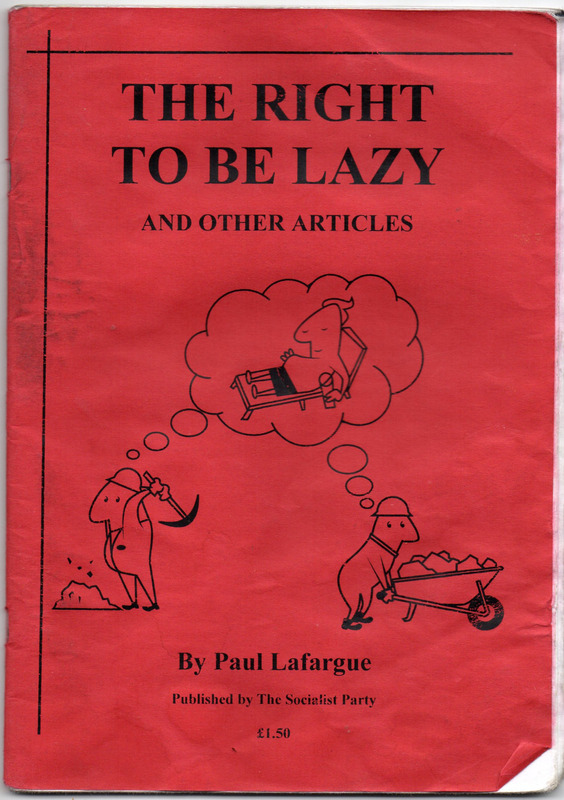 La morale capitaliste, piteuse parodie de la morale chrétienne, frappe d’anathème la chair du travailleur; elle prend pour idéal de réduire le producteur au plus petit minimum de besoins, de supprimer ses joies et ses passions et de le condamner au rôle de machine délivrant du travail sans trêve ni merci. Les socialistes révolutionnaires ont à recommencer le combat qu’ont combattu les philosophes et les pamphlétaires de la bourgeoisie; ils ont à monter à l’assaut de la morale et des théories sociales du capitalisme; ils ont à démolir, dans les têtes de la classe appelée à l’action, les préjugés semés par la classe régnante; ils ont à proclamer, à la face des cafards de toutes les morales, que la terre cessera d’être la vallée de larmes du travailleur; que, dans la société communiste de l’avenir que nous fonderons “pacifiquement si possible, sinon violemment”, les passions des hommes auront la bride sur le cou: car “toutes sont bonnes de leur nature, nous n’avons rien à éviter que leur mauvais usage et leurs excès “, et ils ne seront évités que par leur mutuel contrebalancement, que par le développement harmonique de l’organisme humain, car, dit le Dr Beddoe, “ce n’est que lorsqu’une race atteint son maximum de développement physique qu’elle atteint son plus haut point d’énergie et de vigueur morale”. Telle était aussi l’opinion du grand naturaliste, Charles Darwin . 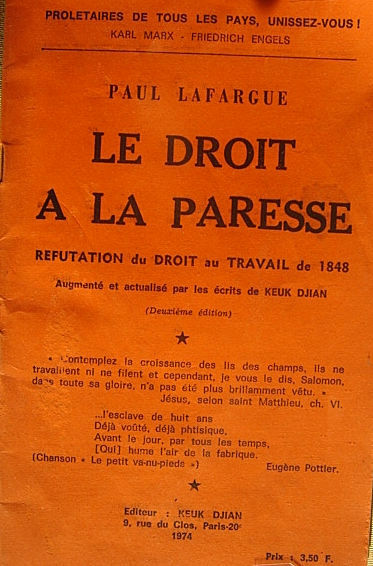 La réfutation du Droit au travail, que je réédite avec quelques notes additionnelles, parut dans L’Égalité hebdomadaire de 1880, deuxième série. An announcement has been placed in Izvestiia and in Pravda which makes known the decision of the Soviet government to seize as hostages SRs [Social Revolutionary party members] from the Savinkov groups, White Guards of the nationalist and tactical center, and Wrangel officers; and, in case of an [assassination] attempt on the leaders of the soviets, to “mercilessly exterminate” these hostages. Is there really no one around you to remind your comrades and to persuade them that such measures represent a return to the worst period of the Middle Ages and religious wars, and are undeserving of people who have taken it upon themselves to create a future society on communist principles? Whoever holds dear the future of communism cannot embark upon such measures. And don’t your comrades understand that this is tantamount to a restoration of torture for the hostages and their families. And revolutionaries assume the responsibility of defending themselves before a court which threatens their lives. Louise Michele chose this way. Or they refuse to be persecuted, as did Malatesta and Voltairine de Cleyre. Even kings and popes have rejected such barbaric means of self-defense as the taking of hostages. How can apostles of a new life and architects of a new social order have recourse to such means of defense against enemies? Won’t this be regarded as a sign that you consider your communist experiment unsuccessufl, and [that] you are not saving the system that is so dear to you but only [saving] yourselves? Don’t your comrades realize that you, communists (despite the errors you have commutted), are working for the future? And that therefore you must in no case stain your work by acts so close to primitive terror? [You must know] that precisely these acts performed by revolutionaries in the past make the new communist endeavors so difficult. I believe that for the best of you, the future of communism is more precious than your own lives. And thoughts about this future must compel you to renounce such measures. Durruti, whom I saw but a month ago, lost his life in the street-battles of Madrid. 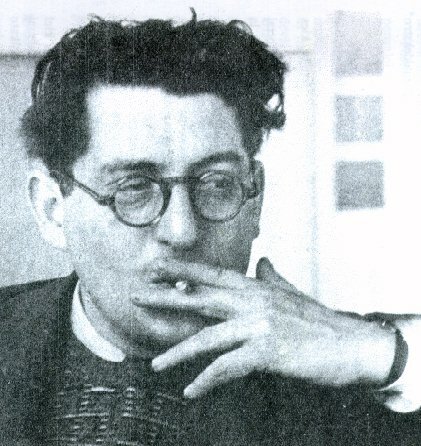 My previous knowledge of this stormy petrel of the Anarchist and revolutionary movement in Spain was merely from reading about him. On my arrival in Barcelona I learned many fascinating stories of Durruti and his column. They made me eager to go to the Aragon front, where he was the leading spirit of the brave and valiant militias, fighting against fascism. I arrived at Durruti’s headquarters towards evening, completely exhausted from the long drive over a rough road. A few moments with Durruti was like a strong tonic, refreshing and invigorating. Powerful of body as if hewn from the rocks of Montserrat, Durruti easily represented the most dominating figure among the Anarchists I had met since my arrival in Spain. His terrific energy electrified me as it seemed to effect everyone who came within its radius. I found Durruti in a veritable beehive of activity. Men came and went, the telephone was constantly calling for Durruti. In addition was the deafening hammering of workers who were constructing a wooden shed for Durruti’s staff. Through all the din and constant call on his time Durruti remained serene and patient. He received me as if he had known me all his life. The graciousness and warmth from a man engaged in a life and death struggle against fascism was something I had hardly expected. I had heard much about Durruti’s mastery over the column that went by his name. I was curious to learn by what means other than military drive he had succeeded in welding together 10,000 volunteers without previous military training and experience of any sort. Durruti seemed surprised that I, an old Anarchist should even ask such a question. “I have been an Anarchist all my life,” he replied, “I hope I have remained one. I should consider it very sad indeed, had I to turn into a general and rule the men with a military rod. They have come to me voluntarily, they are ready to stake their lives in our antifascist fight. I believe, as I always have, in freedom. The freedom which rests on the sense of responsibility. I consider discipline indispensable, but it must be inner discipline, motivated by a common purpose and a strong feeling of comradeship.” He had gained the confidence of the men and their affection because he had never played the part of a superior. He was one of them. He ate and slept as simply as they did. Often even denying himself his own portion for one weak or sick, and needing more than he. And he shared their danger in every battle. That was no doubt the secret of Durruti’s success with his column. The men adored him. They not only carried out all his instructions, they were ready to follow him in the most perilous venture to repulse the fascist position. I had arrived on the eve of an attack Durruti had prepared for the following morning. 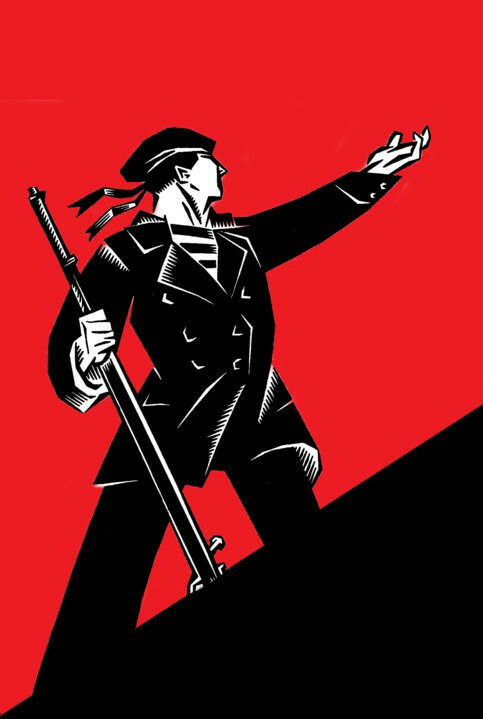 At daybreak Durruti, like the rest of the militia with his rifle over his shoulder, led the way. Together with them he drove the enemy back four kilometers, and he also succeeded in capturing a considerable amount of arms the enemies had left behind in their flight. The moral example of simple equality was by no means the only explanation of Durruti’s influence. There was another, his capacity to make the militiamen realize the deeper meaning of the antifascist war–the meaning that had dominated his own life and that he had learned to articulate to the poorest and most undeveloped of the poor. Η μπροσούρα του Νέστωρα Μάχνο μεταφράστηκε για πρώτη φορά από τα ρωσικά στα αγγλικά από τον Μάικ Τζόουνς. Στα ελληνικά μεταφράστηκε από τον James Sotros τον Φεβρουάριο 1996 στη Μελβούρνη, όπου και κυκλοφόρησε σε μπροσούρα από το «Ούτε Θεός-Ούτε Αφέντης» τον Δεκέμβριο 1998, σε περιορισμένο αριθμό αντιτύπων. Ο αναρχισμός είναι μια ζωή ελευθερίας και δημιουργικής ανεξαρτησίας για τον άνθρωπο, μια κατάσταση δηλαδή που δεν εξαρτάται από θεωρίες ή από προγράμματα που προσπαθούν να ελέγξουν τη ζωή του ανθρώπου στο σύνολό της. Είναι μια «διδασκαλία» που βασιζόμενη στην πραγματική καθημερινή ζωή, ξεπερνά όλους τους τεχνητούς περιορισμούς και δεν μπορεί να συνθλιφτεί από κανένα σύστημα. Η εξωτερική μορφή του αναρχισμού είναι μια ελεύθερη, χωρίς κυβέρνηση, κοινωνία, που προσφέρει στα μέλη της ελευθερία, ισότητα και αλληλεγγύη. Οι διάφοροι οργανισμοί μπορούν να δημιουργούνται πλέον, με βάση το ανθρώπινο αίσθημα της αμοιβαίας υπευθυνότητας που έχει παραμείνει αναλλοίωτο σε όλους τους τόπους και όλες τις εποχές. Το αίσθημα αυτό της αμοιβαίας υπευθυνότητας είναι ικανό να εξασφαλίσει την ελευθερία και την κοινωνική δικαιοσύνη για όλους τους ανθρώπους. Είναι η ολοκλήρωση εντέλει του αληθινού κομμουνισμού. Γι’ αυτό, ο αναρχισμός αποτελεί αναπόσπαστο μέρος της ανθρώπινης φύσης, έναν κομμουνισμό στη λογική του επέκταση. Αυτό μας οδηγεί στην αναγκαιότητα να διατυπώσουμε τις βασικές θεωρητικές συνιστώσες του αναρχισμού, με το να χρησιμοποιήσουμε χειροπιαστά υλικά καθώς και με τη συστηματική επιστημονική ανάλυση. Μερικοί άνθρωποι, εχθροί της ελευθερίας και της αλληλεγγύης, προσπάθησαν να αποκρύψουν τις αλήθειες του αναρχισμού και να συκοφαντήσουν τα ιδανικά του. Διάφοροι άλλοι, μαχητές για τα δικαιώματα του ανθρώπου, προσπαθώντας να δημιουργήσουν μια άλλη μορφή ζωής, ανέπτυξαν και εκλαΐκευσαν πλατιά αυτές τις ιδέες. Πιστεύω ότι ο Γκόντγουϊν, ο Προυντόν, ο Μπακούνιν, ο Μοστ, ο Κροπότκιν, ο Μαλατέστα, ο Φορ και άλλοι, ποτέ δεν έκρυψαν από τους ανθρώπους τις αναρχικές ιδέες και ποτέ δεν έδωσαν στις ιδέες αυτές την όψη ενός αμετάβλητου και άκαμπτου δόγματος. Αντίθετα, οι αναρχικές ιδέες αντιπροσωπεύουν μια συμφωνημένη προσπάθεια ώστε να αναδειχτούν οι αναρχικές ρίζες της ανθρώπινης φύσης καθώς και να αποδειχτεί ότι τα δημιουργικά επιτεύγματα του ανθρώπου ποτέ δεν είναι δυνατόν να εκτραπούν από τις αναρχικές ιδέες. Το θεμελιώδες χαρακτηριστικό του αναρχισμού, που είναι η άρνηση κάθε δουλείας και κάθε σκλαβιάς, βρίσκεται μέσα στην ίδια την ανθρώπινη φύση. Αναρχισμός σημαίνει ελευθερία. Ο σοσιαλισμός από μόνος του δεν μπορεί να καταστρέψει τις αλυσίδες της σκλαβιάς. 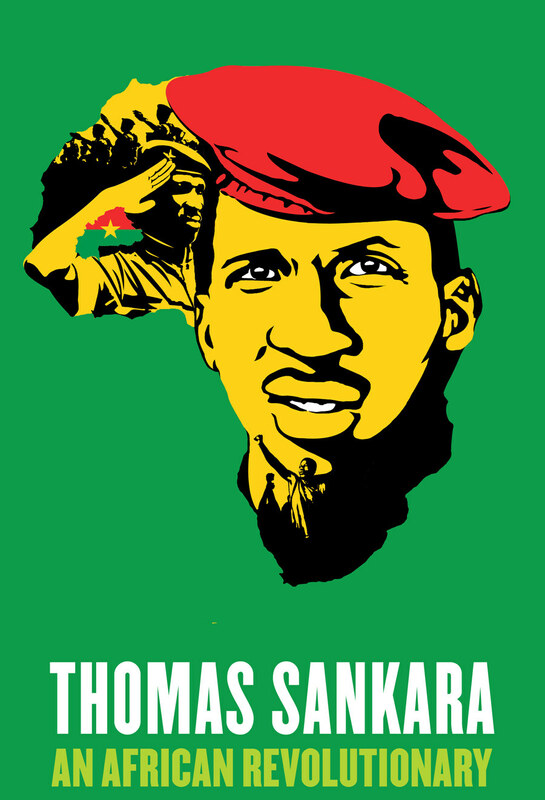 Outside Africa, Sankara is not much known. Africans remember him as a man who told the truth, lived close to his people, fought corruption and gave fresh hope for the recovery of African dignity. He was more than that: a political strategist, an energetic, creative president whose unfailing commitment led to his murder, a loud and clear voice for the demands of the third world. He was born on 21 December 1949 in what was then Upper Volta, a French colony that gained independence in 1960. At school with the children of French settlers, he discovered injustice. He served as an altar boy but refused, at the last minute, to train for the priesthood. At military secondary school in Kadiogo he became interested in politics under the influence of a Marxist teacher who was an activist in the African Independence Party (PAI). As a young officer at the international military academy in Anstirabé, Madagascar, Sankara studied sociology, political science, economics, French and agricultural science. 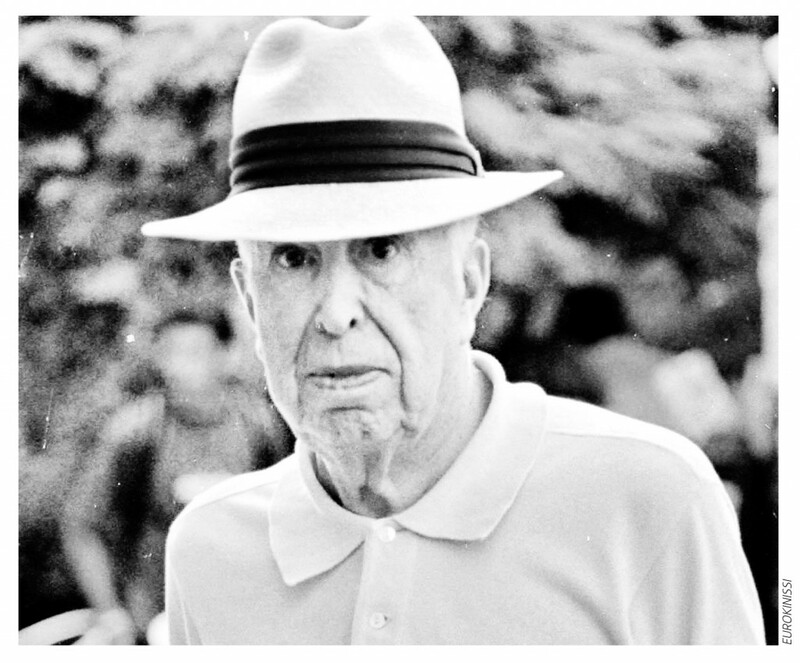 He witnessed the overthrow of Philibert Tsiranana’s neo-colonialist regime in Madagascar in 1972 and that led to his ideas about a “popular democratic revolution”. During the war with Mali in 1974, when he was a young captain, he won attention through a brave exploit, and founded a secret leftwing organisation with other officers. Sankara drew close to far left militants, read widely on many subjects, and acquired a taste for political debate. After independence, Upper Volta alternated between military rule and parliamentary democracy and in 1978 became the only state in the region to elect a president, Sangoulé Lamizana. He ran the country paternalistically; the only leftwing party that took part in elections, and sometimes in government, was the Popular Front (FPV), led by the historian Joseph Ki-Zerbo. It had a base in trade unions. Το αποτέλεσμα είναι η ευφορία μέσα στη δυστυχία। Να αναπαύεσαι, να διασκεδάζεις, να δρας και να καταναλώνεις, όπως όλοι οι άλλοι, να αγαπάς και να μισείς ό,τι αγαπούν και μισούν οι άλλοι, αυτά στο μεγαλύτερό τους μέρος είναι ανάγκες πλαστές। Το γεγονός ότι οι συνθήκες κάτω από τίς οποίες ζει τό άτομο ανανεώνουν και δυναμώνουν συνεχώς αυτές τις ανάγκες, με αποτέλεσμα το άτομο να τις κάνει πια δικές του, να ταυτίζεται μαζί τους και να αναζητά τον εαυτό του στην ικανοποίησή τους, δεν αλλάζει σε τίποτα το πρόβλημα। Οι ανάγκες παραμένουν αυτό που πάντα ήταν, προϊόντα μιας κοινωνίας που τα κυρίαρχα συμφέροντά της απαιτούν την καταπίεση. 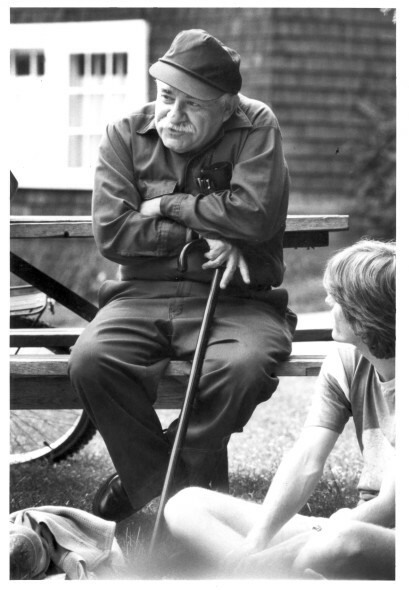 Murray Bookchin – Were We Wrong? of capitalist development and revolutionary change. Is it possible that the Left has been wrong about capitalist development and revolutionary change? Is it possible that 20th-century capitalism is not “moribund;” that the Russian Revolution did not usher in an “era of wars and revolutions,” as predicted by Lenin; that capitalism does not unfold according to an “immanent” dialectic in which lie the “seeds” of its own destruction? Could it be that we are in a ceaseless “ascending phase” of capitalism? We grasp at straws — Hungary in 1956, Paris in 1968, Czechoslovakia in 1969, Poland in the early 1980s — for evidence of a revolutionary proletariat without seeing the tragic marginality of these events. We turn to China, Cuba, Southeast Asia, Portugal, and Nicaragua for evidence of a “revolutionary era” or to the Korean and Vietnamese conflicts for evidence of a “war-ridden era” without seeing their nationalist limitations. We try to acknowledge how ambiguous they are in relation to the larger fact of a greatly expanded capitalism, the extent to which the marketplace has deepened its reach into the most intimate aspects of social life, the striking stability of the system as a whole, its chilling technological sophistication that has made meaningless all images of insurrectionary revolutions in the major centers of capitalism. Nor can we continue to use “betrayals” to explain the failures of the past lour generations. Such a consistent pattern of treachery suggests an internal weakness in the traditional socialist “perspective” of capitalism and revolution that raises more questions than it answers. The socialist project is fragile indeed if betrayal can occur so easily and if “success” yields bureaucratic traits so constrictive and reactionary that history is the better for its failures. The Russian Revolution was a catastrophe whose shadow has cast the entire century into darkness, and lives in our dreams more as a nightmare than a vision of hope. The answers are not to be found in quietism and defeat. It is not defeatist to acknowledge that our expectations were unwarranted and the analyses that nourished them were equally faulty. 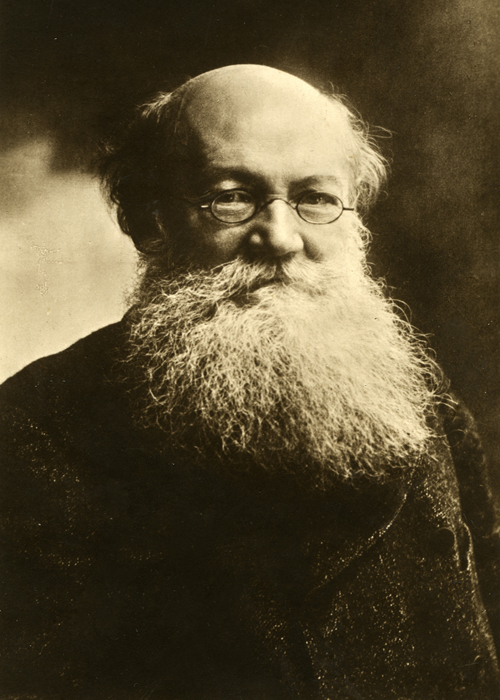 Nor is accommodation possible if capitalism remains irrational to the core; that it has always been so (Marx’s arguments about its “progressive role” to the contrary notwithstanding); and that it has always stood at odds with an abiding potential for freedom and ecological balance. But before that potential can be seen and a relevant practice developed from efforts to realize it, we must clear away the ideological fog that obscures our thinking. This fog arises from a conjuncture of forces that has been seriously misjudged by radicals for more than a century and from a misreading of phenomena that span the last four centuries. 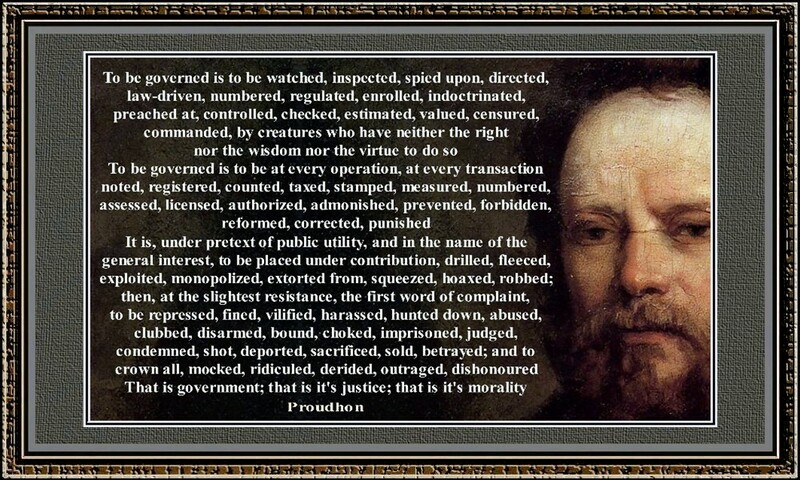 To be governed is to be watched over, inspected, spied on, directed, legislated at, regulated, docketed, indoctrinated, preached at, controlled, assessed, weighed, censored, ordered about, by men who have neither the right, nor the knowledge, nor the virtue. … To be governed is to be at every operation, at every transaction, noted, registered, enrolled, taxed, stamped, measured, numbered, assessed, licensed, authorized, admonished, forbidden, reformed, corrected, punished. It is, under the pretext of public utility, and in the name of the general interest, to be placed under contribution, trained, ransomed, exploited, monopolized, extorted, squeezed, mystified, robbed; then, at the slightest resistance, the first word of complaint, to be repressed, fined, despised, harassed, tracked, abused, clubbed, disarmed, choked, imprisoned, judged, condemned, shot, deported, sacrificed, sold, betrayed; and, to crown all, mocked, ridiculed, outraged, dishonoured. That is government; that is its justice; that is its morality.